HangZhou Ever-Power Vacuum Pumps Co.,Ltd. For the series SK, 2SK, YK and 2YK liquid ring vacuum pumps, multi-vane impeller is fixed ecceentrically in the pump casing. When the vanes rotate, the liquid in the casing forms a liquid ring that is concentric with the pump casing under the centrifugal effect, the cubage between liquid and vanes have a periodic change, so the function of pumping be performed. 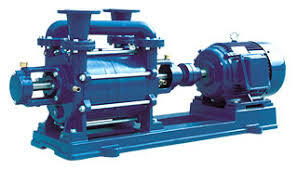 Liquid ring vacuum pumps are of the features of low energy consumption and low noise. They can be used to pump water vapor, inflammable and explosive gas as well as ordinary gases. With special materials used for major parts, they can also pump corrosive gas. Suitable actuating medium or sometimes pumped medium can be chosen as actuating liquids, so the pumps can almost handle all widely used for light, chemical, food, electric power and pharmaceutical industries, etc.